Crete is a very attractive island lying in the Aegean Sea and Aghios Nikolaos, on the east coast sits in a stunning landscape. Overlooking a bay known as the Mirabella Gulf, translating as 'beautiful view', and surrounded by pine clad hills, you can enjoy the area's natural beauty where ever you look. Cheap Aghios Nikolaos holidays are ideal for those seeking peace and relaxation with a guarantee of hot sunshine. The resort offers you a choice of beaches, several of which provide water sports. To the south of Aghios Nikolaos is Almyros beach which is great for families with soft sand and very shallow water. Ammoudi is in a cove and sheltered from winds, a perfect spot for relaxing. Relax in a taverna overlooking crystal clear waters. Most of the beaches have bars and tavernas close by so you are never far from sustenance. Sun bathing can be thirsty work! Apart from a great climate and superb panoramic views, cheap Aghios Nikolaos holidays have much to offer. A wide range of tourist attractions and recreational facilities are found in and around the resort. A popular excursion is a boat trip to the island of Spinalonga, a former leper colony, to which people with the disease were banished. It is hard to believe that was happening up until the late fifties. Aghios Nikolaos has accommodation to suit all budgets. Standards of comfort and service are high. The many restaurants, tavernas and bars cater for all tastes serving traditional island fare as well as international cuisine. In the centre of town there is a very deep lake and as a central attraction many of the eateries are found there. There are plenty of retail opportunities for those for whom shopping is an essential holiday ingredient. Evenings can be spent dining under the stars or dancing into the early hours. The choice is yours. Cheap holidays to Aghios Nikolaos. With flights to Crete from many regional airports and with a journey of around four hours, you can soon be relaxing in the sun. 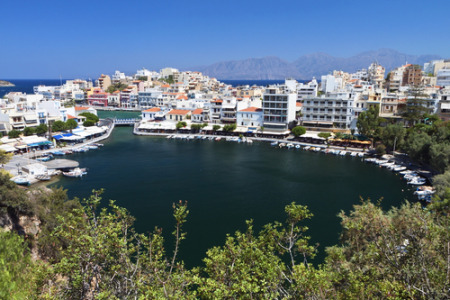 From early spring to late autumn, cheap Aghios Nikolaos holidays promise long hours of daily sunshine. If wish to visit the resort, but find the thought of trawling through web page after web page looking for the best deal more than a little off-putting, try our simple search facility. You'll find over three dozen travel companies, including leading brands, competing for your custom. It is simple to use, and remember, competition brings out the best bargains. Our search facility enables you to see, at a glance, the Aghios Nikolaos holiday that is the cheapest, and the one that offers the best value for money. It couldn't be easier. All you have to do to secure the holiday is make a phone call. As offers change daily, in order to avoid disappointment, you should ring today.